Exhibiting your products or services in a trade show or exhibition has always been a fantastic experience for companies across the world. Such a move is an excellent one to create brand awareness and advertising your offerings to a selective audience. 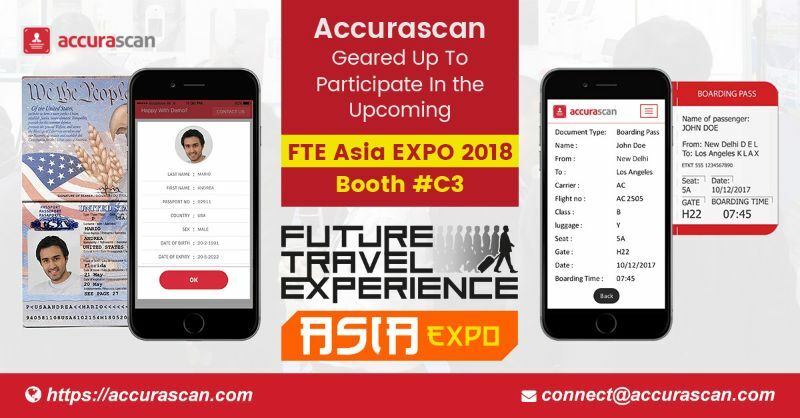 Accurascan an R & D company focusing on computer vision and deep machine learning acknowledges the fact and is all geared up to participate in the upcoming FTE Asia EXPO 2018. During the event, the company will showcase the scope of application of its highly accurate OCR scanning app in the airline industry. Future Travel Experience (FTE) Asia Expo 2018 is providing a unique platform to leading suppliers of Asia to showcase their innovative products, services or equipment to improve the overall customer experience and operational efficiency in the airline industry. The two –day expo will be held in the month of November at Marina Bay Sands. The company will be present at booth #C3 during the coveted event. Along with lightweight OCR scanning app, the company is also keen to display the usefulness of its other offerings-Accura SDK and Accura Web API. While Accura SDK facilitates Accurascan users to customize it as per their business needs, the Accura Web API lets the Accurascan users to enjoy document scanning on a secured cloud server. Both are available for a free trial for a limited period without furnishing credit card information.